An Interruption in your regularly scheduled program…. But THIS just came across my desk and I have to share it with you! It’s a newsletter from Karen Drucker, a long-time acquaintance (talented musician, presenter and comedienne) containing a link to her new album, but also a new music video. I included the whole thing so you can read about Karen but it is the music video (down toward the bottom under “News Flash”) that really got to me. I hope you are also moved to share it. Here’s the link, and yes, I got her permission to post this YouTube. I am officially here! 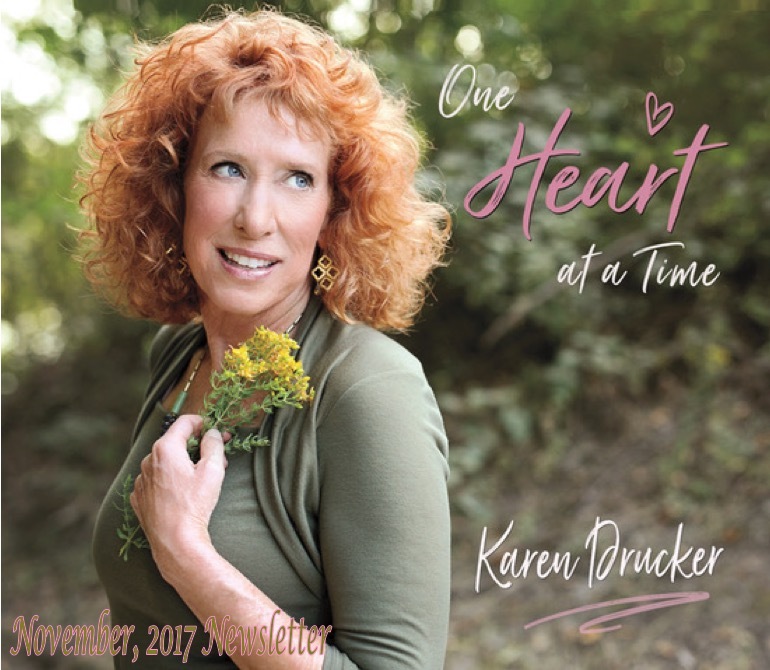 I am Karen Drucker’s new “baby,” a romping little CD named“One Heart At A Time,” and I was brought forth fully birthed today, November 1, 2017 at 8:00 am. Even though Karen has created many other CD’s, she is very excited about me because I am a little different than the others. Like my siblings, I still have the 12 songs/chants that she normally does on all her CDs, but I am unique because I have what Karen is calling “musical meditations.” This is a chant where you think of something you want to let go of, or forgive, or be grateful for, and you sing along with Karen and her amazing back-up singers over and over until you feel a shift in your heart. I overheard her saying that she hopes people will get into the trance-y state she got into while singing these songs, and that it might help people heal some of the pain that is going on in the world. The process of my creation was very organic with some songs being written right there in the studio, while others were created with some of her amazing songwriter friends. She is so grateful to work with some of the best musicians in the Bay Area, and she was moved to tears a few times watching them put their creativity into this project resulting in me being born today. So world – here I am! I hope that you will take a listen and share with your friends if you enjoy me. I am very happy to be born, and happy to share myself with all of you! “Let It Go” – hope you enjoy it!! Keynote talk, concert, and workshop along with other inspiring presenters. Talk and music at the 8:30, 10:00, 11:30 am services & afternoon workshop. Debuting my new CD at the 7:15 pm service. Talk and music at the 9:00 and 11:30 am services & afternoon concert. “Going to the Dogs” fundraising concert for Humane Society. The song I wrote with JD Martin and David Roth, “Home of the Brave,” has been nominated for a “Posi Award” in the video category. This is a very special song about the current immigration situation and a beautifully done video by Sherry Hursey and Rick Cowling of ToTL Entertainment. This is the one category that is based solely on fan voting. As much as it feels awkward to ask for you to vote for this video, I would love to honor the work of Sherry and Rick and get this video seen by more people to do good in the world. Thanks for lending your support! * If you are not already a member of empower music you will need to enter your email address and create a password in order to vote. You can unsubscribe at any time. Check out my website for more details and other events that are coming up! I hope to see you at one of my events this year!! Posted on November 2, 2017 November 2, 2017 Categories Awakenings, FREEDOM, Friend, Gratitude, Light, Music, my kind of politics, Perspective, SpiritualityTags Immigrants, Inspiration, Music, Pilgrims, Refugees, spiritualityLeave a comment on An Interruption in your regularly scheduled program….